Experience the thrill of this full-day Zambezi River Whitewater Rafting Adventure from Victoria Falls. Your onboard rafting instructor will show you the ropes and then paddle with you along some 15 miles raging of level five rapids. Your team will navigate through deep-valley canyons and breathtaking scenery as you make your way across one of the continent’s most notorious rivers. Experience is not required, but a bit of bravery and some level of fitness are essential! Meet your friendly, professional driver at your Victoria Falls hotel and travel to the nearby banks of the famed Zambezi River, where you’ll meet your instructor and enjoy a warm drink while you learn about the adventurous day that lies ahead. Equipment—including lifejacket and helmet are provided, and your guide will insure perfect fit before departure. You’ll follow your instructor through steep, rocky trails to Bokota Gorge, where your Victoria Falls Zambezi River Whitewater Rafting Adventure begins. 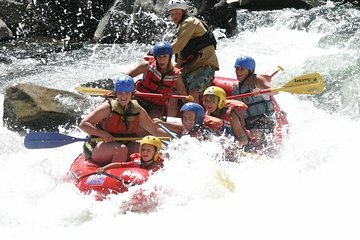 Your 8-person team and expert instructor will help you navigate the long and fast-moving rapids that make this level-five trip a beast to manage. Experience isn’t required and falling out of the boat is part of this memorable experience. Teams will have to work together to move through these challenging, fast-moving waters where steep grades and big drops are part of the thrill. Enjoy a light lunch at a gorge-side café at the journey’s mid-point before hopping back into the raft to navigate the most demanding part of the river. Your journey ends with the final rapids. You’ll climb out of the gorge after this heart-stopping adventure and return to the base center where your minibus and driver will meet you for transport back to your Victoria Falls hotel.